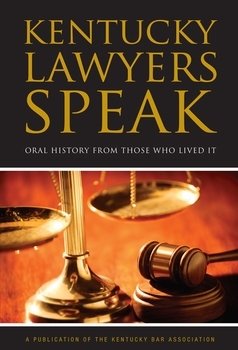 In Kentucky Lawyers Speak: Oral History From Those Who Lived It, seventy-four lawyers — interviewed over a fifteen-year period, between 1993 and 2008 — share stories and personal reflections on their lifetime of practicing law in the Commonwealth of Kentucky. This unique collection of one-on-one conversations with senior members of the Kentucky Bar is fascinating and important reading for students of history and the law. Born between 1903 and 1933, they all lived through the Great Depression, fought in World War II and Korea, and have left indelible marks on the legal profession in Kentucky. Their oral histories and reminiscences, captured in over 4,000 pages of original transcripts, have been edited by the Kentucky Bar Association, with support from the Kentucky Bar Foundation, into this extraordinary collection of interviews which will preserve their life stories and legacy for posterity and inspire future generations of Kentucky lawyers.